This is the first year she has attempted it (I enticed both the children to give it a go) and she is already talking about next year. In fact, she has stated that she will have a writing day every week and just carry on with the story until next year’s challenge starts and then she can start “Book 2”. I am so delighted that she has enjoyed it and really hope she lets us read her output (I have resisted surreptitious glancing over the shoulder). 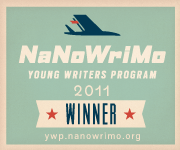 The NaNo Young Writers Program is slightly different to the adult version in that it allows you to set your own word count target. When we discussed it, I originally suggested that DD aim for 3000 words, thinking that this is a passably decent short story length and achievable for an eight-year-old first-timer. (I didn’t want her to set the bar so high that she would be put off after a couple of days). DD was having none of it though – 9000 was the target she set herself and she did it! Over 800 of those words were written last night in the final push and given that there were days when I was struggling to get past 500 words myself, I am full of admiration for her. Even after we verified her word count and it was 55 words short, she wailed and despaired for a bit but then sat back down and (fuelled by a couple of Crunchie Rocks) wrote another 60-odd words to nudge herself into the winners’ enclosure. Bless her! Admittedly, she needed a little bit of pushing, not because she had lost interest at any point (as DS did after a couple of days), but just because sometimes she’d rather play or watch TV (especially if it was on in the background distracting her). The really cool thing is that she did it all for no other incentive than to get a certificate to show at school and, more importantly, to be able to stick her tongue out at her elder brother (with parental approval) because she succeeded where he had given up. (The tongue ceremony took place this morning, complete with raspberries :D) I will be buying her something really nice, of course, but she doesn’t know that yet and I’m thrilled that she did it all for the kudos, rather than for some material reward. Perhaps next year her school will show an interest (I have mentioned it once or twice) and more children (and perhaps some of the staff) can experience the sense of achievement that comes from writing. I hope so.